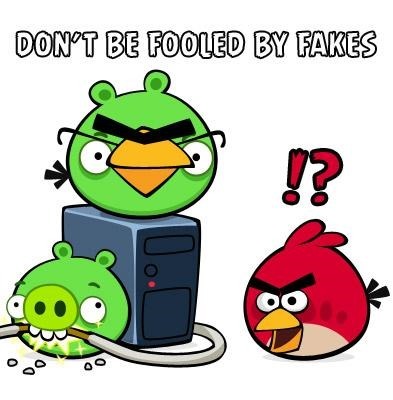 Fake Angry Birds Space For Android On Google Play Store Is Riddled With Malware, Beware! Last week, we reported of a strain of malware in the wild that, although described innocently as Rovio Mobile’s latest addition to the Angry Birds series, was indeed the Legacy Native (LeNa) malware first seen last fall, and has the potential to remotely gain root access to Android users’ devices. Well now, various tech outlets have confirmed the suspect Angry Birds Space app has now reached the Google Play Store, thus Droidsters are warned to proceed with extreme caution. As detailed in the earlier reports, security firm Sophos notes the malware hides its “payload” within two .JPEG image files, and once it’s infiltrated your device, it then begins downloading further malware onto your phone, while enlisting it as part of a botnet. Once that occurs, you’re even deeper in the brown stuff, since your device can then be used for all manner of unscrupulous tasks. In order to kelp yourself free from this and any other form of malware, you’re advised – as ever – to exercise common sense. Always check the developer of every app you download in order to ensure it is legitimate. If you believe you may have erroneously downloaded the infected Angry Birds space, you should back up any important data and wipe your phone immediately, before any (further) damage can be done. This will serve as more unwelcome news for Google, whose Android mobile OS has been a regular in the press for security lapses. With the reach of Android-wielding devices expected to eclipse the 200 million mark by the end of the year, the Big G will have to do a lot better to protect its customers than its current showing. As has been pointed out a lot in recent weeks, the Bouncer implementation – which was supposed to be a preventative measure in combating malware-infested files – hasn’t exactly appeared to be much of a deterrent. The Angry Birds malware caps of a pretty bleak few days for digital security as a whole. Apple has been scrambling to release a Java update to remedy the Flashback Trojan issue, and consumers will now be looking for a similar reaction from Google. Could the recurrence of malware eventually become a detriment to Android’s sales and reputation? Leave your thought and opinions via the usual mediums below.